There’s a default assumption that big war movies are based on fact. Think of A Bridge Too Far, Das Boot, or more recently Dunkirk. And there’s room for tolerance when the movie is clearly fictional, whether it’s Apocalypse Now with its literary boots in Heart of Darkness or the big-boy romp Inglourious Basterds. When I wrote my third novel Cairo Mon Amour, I was meticulous about making sure the historical setting of the Yom Kippur War was accurately portrayed. That’s what writers do, isn’t it? So what has this do with the 1961 movie The Guns of Navarone? I happened to be staying with friends in Rhodes recently. 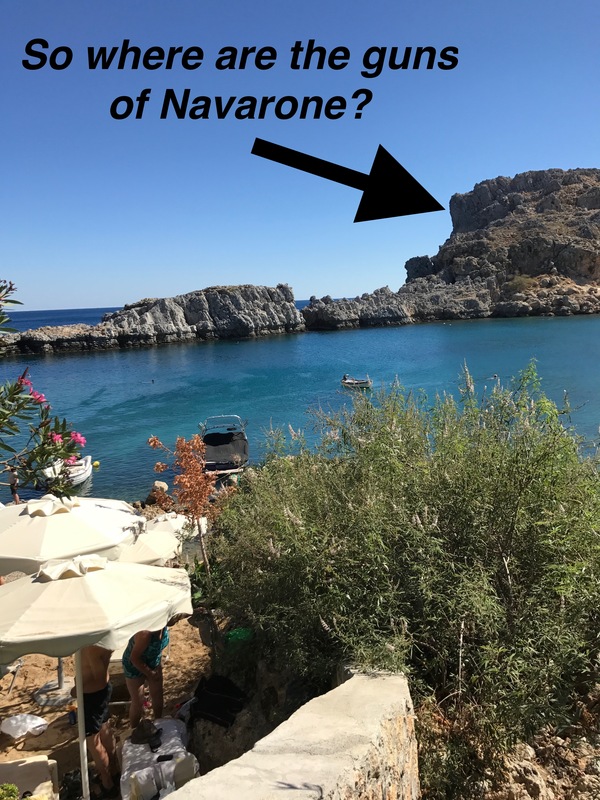 They live at Navarone Bay at Lindos, and I was looking forward to seeing the location of a movie that had thrilled me when I was thirteen. In case you missed it, The Guns of Navarone is a WWII thriller in which a bunch of Allied tough guys led by Gregory Peck, are thrown together in a crack team to blow up a huge German gun emplacement. Our man Peck plays a famous retired mountaineer who will climb up and knock out the guns, which are concealed deep inside a high cliff overlooking Navarone Bay. “So where were the guns?” I asked my old friend, pointing at the cliffs. “Made up?” I was stunned. The Guns of Navarone was one of the best films I’d ever seen. It has been part of my personal film canon (no pun intended) for decades. It had never occured to me that the story wasn’t true. You can find out more about Cairo Mon Amour here. I’m still shaken by it, Kerry. Loved the blog, meant to add that some weeks after you left, with the movie still in the DVD, we finally got around to seeing the end. More interesting are the shots of Rhodes old town used as the backdrop ‘Mandraki’ – this is 1961 and most of the buildings are still there. Contrast with London where most of the city has been concreted over. The march of time is exceeding slow here. It’s a Greek thing. Good memories, Paul. Yes, things move real slow in Rhodes! what he did?) from the Italians before the Germans could. This was set against those islands lying just a few miles off the coast of Turkey. The campaign was a disaster after the cream of the German war machine, rested and ready, defeated the British on both locations and the exhausted and helpless remnants were evacuated from Symi. Thanks for this feedback. I feel a little bit better now! All the best, Stuart.